For customized graduation cards, you can’t beat MailPix! We offer affordable prices and high quality results so you can send out personalized graduation cards with a professional look! Our glossy photo cards are a great option since they’re printed on high quality photo paper for the best in color and clarity. From senior portraits to snapshots with friends, you can create customized graduation cards that are full of personality. Invite friends and family to your grad celebration in style! In addition to photo graduation invitations, we offer a wide range of personalized graduation gifts! Create photo mugs, canvas prints and photo magnets for perfect grad gift set! Select from multiple templates and create a unique Mothers Day card for Mom! You can add a fun picture of yourself or upload a cherished family memory to make it all the more special. 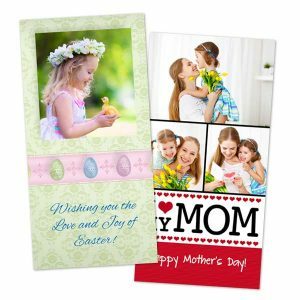 Mother’s Day is a great time to show how much you love Mom, so why not do it in style with a high quality glossy photo card? Make Dad feel special this Father’s Day with a custom photo card! Our glossy card option is available in range of templates that you can fill up with Dad’s favorite pictures. Then, add a personal message to complete your design. We also offer personalized gifts for Father’s Day to give Dad in addition to a customized greeting! Create a personalized necktie for him to wear at work, or design a photo apron that he can use for summer BBQ’s. For an unforgettable Father’s Day, MailPix is your one-stop shop! Our glossy photo cards are a great way to liven up any greeting or invitation with your prized memories. No matter the occasion, we have hundreds of template styles to select from, including holiday, custom save the date invitations, photo thank you cards and more. Our glossy photo paper cards not only come in a large variety of styles and layouts, but they can include personalized text for a truly professional look. Designing your own photo cards couldn’t be easier. Our user-friendly project editor makes the process simple and fun and you can customize your own layout in a matter of minutes. Use your own photos to give your greeting cards a distinctive look and add a personalized flair with your own heartwarming message, no matter the time of year. Start off by uploading your photos and creating your own album in your MailPix photo folder. After you have finished uploading, choose your card size and orientation. Then, select from our collection of occasion-themed templates and choose the perfect style for your card layout. Finally, it’s time to start the creative process. Drag and drop your photos onto your selected layout and add your own text. You can even customize your own arrangement with just a few simple clicks of your mouse. Lastly, review your card layout and then place your order. Each photo card comes with its own envelope making it a breeze to send out to friends and relatives. You can even hand write your own message on the back of your photo card to include a personalized note. Customize your cards to your liking and send them out for a greeting your loved ones won’t soon forget! Less formal than wedding invitations, save the date cards are a great way to let all your friends and family know that you’ve decided to tie the knot several months before the big day. A save the card is a fun way to share your favorite engagement photo and let your prospective guests know when and where your wedding will be held. Our classic photo cards are an ideal choice when you want to design custom save the date cards online. What better way to show your appreciation than with a custom photo card. Create custom thank you cards that showcase a treasured photo. Our glossy photo cards can be printed with a cherished picture on the front and are perfect for your own handwritten message on the back. Send a message of thanks to your friends and family for a beloved gift or for simply helping you out in a time of need. 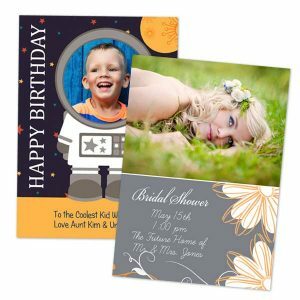 If you’re looking for a more affordable route for creating your own custom wedding card, then our glossy photo printed cards are the way to go. Select from several designs and photo layouts and add your own text in the card builder with details about the big day. Engagement pictures and couples photos are perfect for designing your own personalized wedding cards. Are you planning an upcoming celebration? Maybe you’re starting to think about sending out invitations to all your guests. Why not get creative and design your own party invitations that display a beloved photo. Our classic photo print cards can be fully customized with our stylish, colorful templates for an invitation that’s sure to impress. If you’re in the midst of planning a birthday party, why not send out a fun photo birthday party invitation to all your friends and family. Add a favorite photo of the birthday boy or girl to your chosen card template and use our text feature to add details about the upcoming celebration. Our photo birthday invitations come in a variety of stylish templates and backgrounds that are perfect for any birthday party theme. Graduations are another event that are perfect for custom invitations. Simply, upload your grad’s best senior year photo and create a graduation invitation using our classic photo cards to send out to all your family and friends. We offer several graduation themed templates that you and your grad are sure to agree on. Then, add your own text to fully personalize your graduation invitation in style. Did you just finish moving into your new home and want to share your new digs with your friends and family? Why not create your own moving announcement complete with a fun, family photo. Share your new address with family and friends and even use it as an invitation for your upcoming housewarming party. Perhaps you just brought you new little bundle of joy home and you want to share your happiness with all your loved ones. Design your own new baby announcements and create your card layout by using your little one’s very first picture. Include your baby’s birth date and time, name and weight and introduce your new family member to the world in style. Share your big news with friends and family with our custom photo announcements. Our photo paper cards are perfect for the occasion and can be tailored to your specific needs with a wide variety of distinctive and elegant templates. Whether you want to create a stylish announcement, build a festive invitation or design the perfect holiday card, look no further than MailPix. Our 4×8 and 5×7 classic photo cards can be personalized with your very own photos and text. Not only can you design your own greeting card masterpiece, but it’s easy to do! After gathering your pictures, you can simply upload your photos directly to MailPix, choose your card size and template and drop your photos onto your chosen layout. All of our classic photo cards come with complimentary envelopes so you can hand write your own message on the back and promptly send them out to all your loved ones. No matter the occasion, it’s easy to make your photo cards and design them to your liking, all year long!